Most economists believe that an increase in the minimum wage causes higher prices and lower employment. This belief rests partly on empirical evidence, but also on the view that labor markets are competitive; if markets are competitive, then increases in the minimum wage should both raise prices and reduce employment. However, a number of studies in the last decade have challenged these beliefs. Some of these studies have argued that the market for low-skilled labor has special characteristics that undermine the traditional economic consensus. They claim that the market for low-skilled labor isn’t competitive and employers have the power to set wages. As a result, an increase in the minimum wage will not necessarily lead to employment loss. To test this claim, Daniel Aaronson and Eric French examined government-collected price data. In a series of studies over the last four years, Aaronson and French show that a 10 percent hike in the minimum wage increased restaurant prices on the whole by 0.7 percent, and prices at limited service establishments by 1.6 percent. This result, in combination with other information about the restaurant industry, can be used within a formal model of the labor market to infer the impact of a minimum wage increase on employment. They find that employment losses of 2 to 2.5 percent following a 10 percent increase in the minimum wage would be consistent with their estimated price responses. These findings are consistent with a competitive model but generally not consistent with imperfect competition models where individual restaurants have wage-setting power. This paper summarizes Aaronson and French’s results. Beginning in the early 1990’s, research by economists David Card and Alan Krueger sparked a debate regarding the employment effects of minimum wage increases. In a series of papers, these authors found that increasing the minimum wage has no—or even a small positive—effect on employment. In explanation of these surprising findings, the authors theorized that there were special characteristics of the low-skilled labor market that allowed employers to obtain monopsony power—a situation in which they would be able to set wages in the overall labor market. Since Stigler (1946), it has been known that under monopsony power, an increase in the minimum wage could increase employment. By contrast, if local labor markets are competitive, it is expected under general conditions, that an increase in the minimum wage will cause employment to decrease and prices to rise. Since the original Card and Krueger research, many studies have reestimated the impact of minimum wage increases on employment, with most finding some evidence of disemployment, although the magnitude of these effects remains somewhat contentious. Tracking price responses rather than employment responses offers an alternative method of measuring the market structure of low wage labor markets. Changes in the size of the workforce have a direct impact on output—increases in the workforce lead to more output, while decreases lead to less output. When output increases as a result of increased labor, prices will fall. The reverse is also true—lower output from a smaller workforce leads to higher prices. Thus price responses can be used to infer the competitive nature of the labor market. Using a variety of government and private datasets, Aaronson and French show that prices do in fact rise in response to a minimum wage increase. Aaronson (2001) finds that minimum wage increases tend to raise prices. The magnitude and timing of these price increases is striking. Within three months of a wage hike, Aaronson finds that a 10 percent increase in the minimum wage resulted in a 0.4–0.7 percent increase in restaurant prices. Much of the increase occurred within the first month of the wage hike. In the fast food sector, prices rise 1.5 percent in response to a 10 percent increase. Aaronson, French, and MacDonald (2004) utilize store-level Consumer Price Index (CPI) data generated by the United States Bureau of Labor Statistics (BLS) to separate firms by their relative use of low-skill, entry-level employment. A wage hike will particularly affect those firms employing a higher percentage of teenagers and other low-skilled employees. Using this new data, the authors find further evidence that prices rise following a wage hike. Tellingly, they also find that in areas where a greater number of employees earned the minimum wage, the price increases are larger than the overall results. Utilizing these price responses, along with other information about the restaurant industry such as labor’s share of costs and the demand elasticity for restaurant services, Aaronson and French (2003) construct a formal model to indirectly pin down the employment response to a minimum wage increase. In a perfectly competitive labor market, the authors find that a 10 percent increase in the minimum wage will result in a 2.5 to 3.5 percent decrease in employment. When the authors augment that model to allow for the possibility that employers have monopsony power, they find a calibrated employment response that is only slightly smaller (2 to 2.5 percent) than the perfect competition case. These results suggest that restaurant labor markets are generally consistent with competitive conditions but not with the monopsony model. 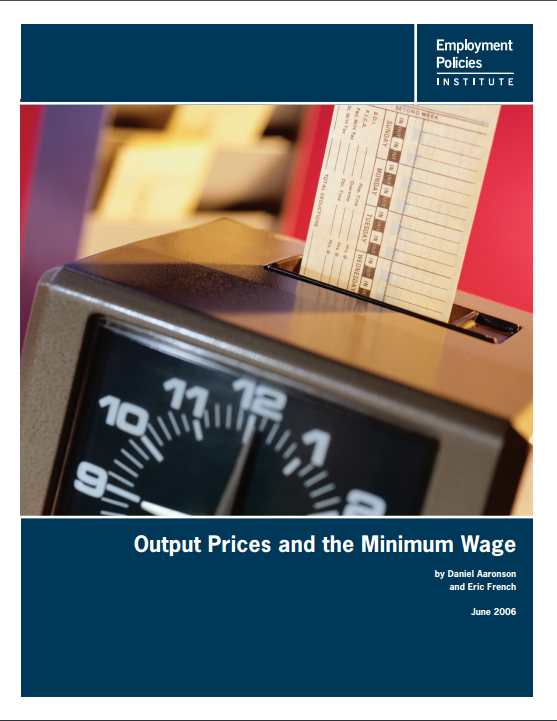 Although recent research has sparked intense interest in the role of imperfect competition in low-wage labor markets, Aaronson and French’s result that higher labor costs from minimum wage increases are pushed on to consumers in the form of higher prices is consistent with the competitive model, but not the monopsony model. Therefore, their results should temper interest in monopsony models as an explanation for small disemployment effects of the minimum wage.